WVI’s Louise Heathcote publishes her latest Wildlife Creation: colourful pinwheels to blow the February blues away. Please share your creations with us by posting pictures on our Facebook and Twitter feeds. Louise has been inspired by WVI’s commitment to providing expert surgical skills to hundreds of birds, including species like the Critically Endangered white-backed vulture, Endangered Egyptian vulture and Sarus crane. Thousands suffer terrible injuries during Uttarayan and the International Kite-Flying Festival in the Gujarati city of Ahmadabad, India. "Birds are caught up in the cutting string, which is covered with crushed glass, causing partially severed wings and broken legs. Birds arrive at the makeshift surgery set up specifically for birds rescued during Uttarayan, in a terrible state" says Louise. Each January since 2013, WVI has sent a specialist avian vet, Johanna Storm, to help a local animal welfare organisation, the Jivdaya Charitable Trust, treat thousands of affected birds. While she is there Johanna is also able to give invaluable hands-on training to local Indian vets. When Johanna hasn't been able to go we have supported a vet nurse to support the Indian vets and more laterally, to support new WVI vet Stefan Harsch. 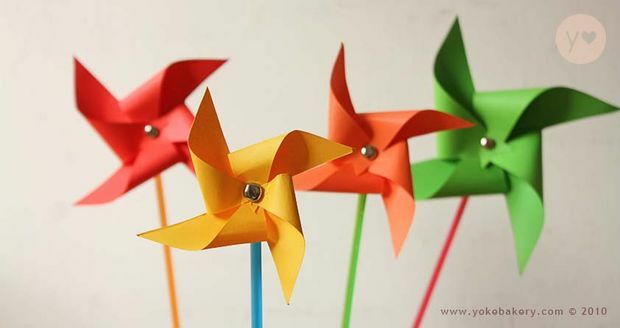 "I decided to create Pinwheels this month as they rely on the wind and are at their most beautiful when they are turning with their colours vividly flashing past. They can be any colour, pattern or design and could represent the many species of bird affected in India by this barbaric practice of covering the strings in broken glass" Louise told WVI. 1. Take a sheet of paper and fold the corner of the paper to form a triangle. 2. Cut along the edges of the triangle. If you unfold the triangle you should have a square shape. Fold it back up and fold the triangle cut out in half to make a fold line. 3. Unfold and cut 2/3 way into the fold line. 4. Unfold the triangle into a square and you’ll see 2 corners with cuts. Repeat for the other 2 corners. 6. Punch holes on 4 flaps of the paper as shown. 7. Poke a hole in the middle of the paper using any sharp tool. Then use a pencil tip to gradually widen the hole. 8. Use any sharp tool to poke a hole through the straw (near the end). You may want to use some Blu Tac as backing support while making the hole; please don’t use your hand/fingers! Use a pencil tip to gradually widen the hole. 9. Bring all 4 corners (with hole) towards the middle of the pinwheel. Put a paper pin fastener through all holes (4 flaps and 1 in the center of pinwheel). 10. Attach straw to pinwheel by placing the hole on the straw through the paper pin at the back of the pinwheel. 11. Bend the paper pin’s tips to fasten pinwheel together and you’re done! Please download a pdf of the instructions here. How creative can you be? Post your pictures on our Facebook and Twitter feeds.